If you were to die in the next 5 minutes, do you know where you would go? 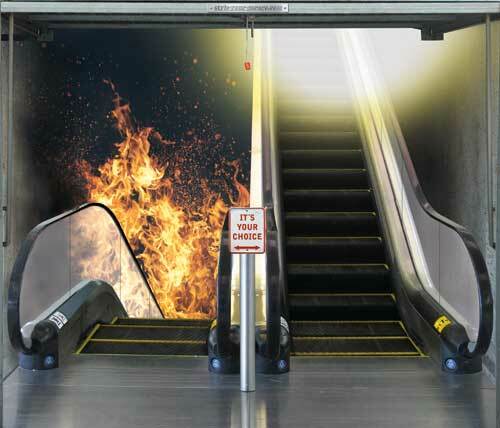 Would you go to heaven or would you go to hell? The bible tells us hell is reserved for the wicked, for the evildoers, for sinners. Have you ever lied? I know I have and that makes me a liar. Have you ever taken anything that didn’t belong to you? I know I have and that makes me a thief. Have you ever made anything or anyone more important than God? I have and that makes me an idolater. What I’m trying to say is I have sinned. I am a sinner. God is a righteous judge and I would be judged for my sins. 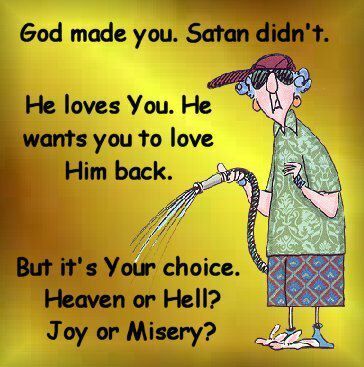 Because of my sinful nature, I would go to hell. But the Father in His great compassion and love for me sent his son, Jesus, who never sinned, to take my place and pay the price for my sins. His death on the cross was a sacrifice so that I would not have to spend eternity separated from the presence of the Father. I have accepted Jesus Christ as my Lord and Savior. I am now born again, spiritually. 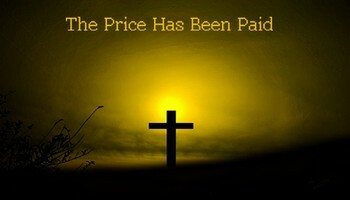 Since the price has been paid, God no longer holds my sins against me. When I gave my life to the Lord Jesus Christ I didn’t hear any bells or whistles. I didn’t see heaven open up and a dove hover above me, but I knew in my heart that I was different. I had changed. I had become a child of God. Satan will never have power over me ever again. I no longer have the stain of sin on me. The blood that Jesus shed on the cross has made me pure in the eyes of the Father. I am now spotless, holy and righteous. I now have the nature of God. There is no other way into the Kingdom of heaven but through Jesus. You too can have the peace of knowing where you’re going when you leave this world. The following devotional by Bob Gass is so powerful I just had to add it here. I hope it will bless you as it did me. A popular tale tells of a church pastor introducing a visiting elderly minister before inviting him to speak. The visitor shares: "A father, his son, and his son's friend were sailing off the Pacific coast when a storm overturned their boat sweeping all of them into the ocean. Grabbing a rescue line, in a split second the father had to make the most excruciating decision of his life - which boy to throw the other end to and which one to sacrifice. He knew his son had accepted Christ and his friend hadn't. Anguished, the father yelled, 'I love you son,' and threw the rope to his son's friend. By the time he'd pulled the boy back to the capsized boat his son had disappeared beneath the waves. His body was never recovered. The father knew his son would step into eternity with Jesus and couldn't bear the thought of his friend facing eternity without Christ." At the end of the service a teenage boy approached the old man and said, "That's a nice story, but what father in his right mind would sacrifice his son's life in hopes that the other boy would become a Christian?" "You've got the point," the old preacher replied, "It's not realistic. But I'm standing here today to tell you that story gives me a glimpse into what it must have been like for God to sacrifice His only Son for us. You see...I was that father, and your pastor was my son's friend." This story beautifully illustrates the point - The Pharisees who watched Christ die said, "He saved others; Himself He cannot save.' And they were right; He couldn't do both, so He chose to save you. Today will you accept His offer of salvation? CLICK HERE to read Donna Wasson's brilliant article, "Loving Them Straight To Hell." Jesus told the story of a farmer who hired day laborers: some at 6 am, some at 9 am, some at 12 noon, some at 3 pm and some at 5 pm, one hour before quitting time. Amazingly, he paid them all the same wage. When the complaints started flying, the farmer said, 'I wish to give to this last man the same as to you.' You say, 'Nobody pays a day's wage to one-hour workers.' God does. Deathbed converts and lifelong saints enter heaven by the same gate. They don't enjoy the same reward, but they're saved by the same grace. A last minute confessor receives the same grace as a lifetime servant? It doesn't seem fair. The workers in Jesus' story complained too. So the farmer explained the prerogative of ownership: 'Am I not allowed to do what I choose with what belongs to me...' (Matthew 20:15 RSV) The thief on the cross proves that when you request grace with your dying breath, God answers your prayer. The Prodigal Son '...wasted his possessions...' (Luke 15:13 NKJV) The Greek word for 'wasted' pictures a farmer throwing handfuls of seed into the ground. Imagine the Prodigal Son spurning his father's kindness, going out and 'throwing it all away.' But he returned. And when he did '....his father saw him and had compassion, and ran and fell on his neck and kissed him.' (Luke 15:20 NKJV) The Father was saving the son's place. And He's saving yours too. Eleventh hour grace means that if you're able to read these words and respond, it's not too late. Satan said to a convention of Demons, "As long as Christians stay close to God, we have no power over them. So here are 12 things you can do to get victory over Christians." 1) Keep them busy with non-essentials. 4) Discourage them from spending family time together, for when their homes disintegrate there is not refuge from work. 5) Over stimulate their minds with television and computers, so they can't hear God speaking to them. 11) Involve them in good causes so they won't have time for eternal ones. 12) Make them self-satisfied. Keep them busy working in their own strength so they'll never know the joy of God's power working through them. It's never too late to become a child of God. If you want to say this simple prayer or a prayer of your own, you too, can become a child of God and spend eternity in His presence. If you have prayed this prayer, you are now a child of the living God. You are no longer a slave to sin or satan. BUT, now that you have become a child of God, you cannot go back to your old ways. You cannot live as you once did because you now have Jesus within you. I recommend you find a church that teaches from God’s Word - the Holy Bible. Find a church where you can be baptized and grow in your knowledge of Jesus Christ, your savior. Discipleship is very important at this stage. God bless you and welcome to the family of God. Vijayakumar from India writes: "Dear God, I acknowledge that Jesus Christ is Your Son. I believe that He was born of a virgin. He died on the cross and shed His blood for my sins. He arose from the dead and He is seated at Your right hand interceding for me. I confess that I AM A SINNER and have disobeyed Your commandments. I ask You to forgive me of my sins because of the blood of Jesus and not because of good I have done. I ask You, Lord Jesus, to come into my heart and be my Savior and Lord. Place my name in Your book and put Your Spirit within me so that I can live for You. I confess with my mouth and believe in my heart that I AM BORN AGAIN. Thank You." God bless you Vijayakumar, and welcome to the family of God!